We are in the enchanting Tropea, one of the most popular Calabrian tourist destinations. Once through the gate of the ancient garden of Palazzo Gabrielli, there is the restaurant “Porta Vaticana”, and its whole atmosphere, warm and welcoming. 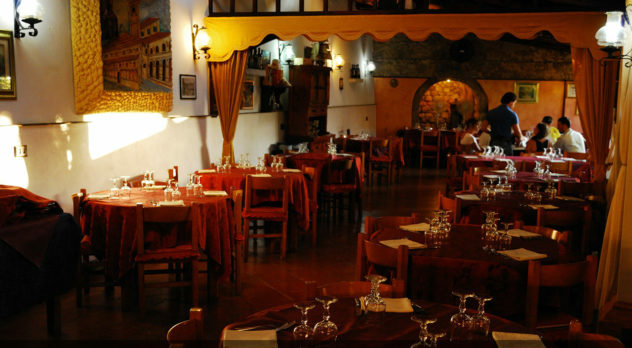 The old structure has been converted into dining rooms, which constitute a very quiet corner even if located in the historic center of the town. A few steps from the square of the cannon, a splendid viewpoint over the sea. The name of the restaurant is due to the ancient Vatican gate, one of the three gates of Tropea, carved in the stone of the adjacent city walls. This charming restaurant is managed with care and cordiality by Michele di Costa and his wife Gabriella Baldo. Entrance, with a wood-burning oven for excellent pizzas. The cuisine especially of fish and the warm and welcoming decor reflect the simple style, typical of the place.